I ventured out into the gardens intending to take pictures of some of the blooming beauties here on my corner of Katy, but I was very quickly driven inside by the heat. 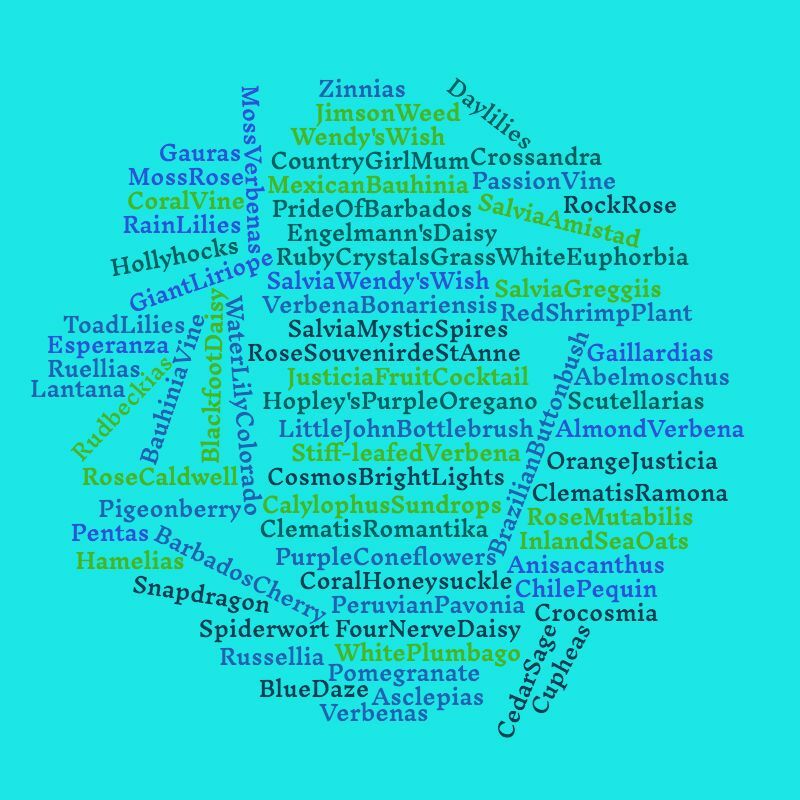 So I've been sitting here in my comfortable chair in my air-conditioned house, composing a word cloud of the plants that are blooming in my garden right now. I dashed out one time to make a quick survey of the front gardens since I needed to jog my memory of what's blooming in those beds. I lasted maybe 3 minutes, then retreated once again to the cooler clime inside. I don't know those of y'all without a/c survive during a heat wave. Mercy, that would be misery and then some. I haven't been doing much gardening in the last 6 weeks or so. I had the joy and the privilege to join a garden tour of the Cotswolds from June 12th-19th, preceded by a visit with the always delightful Layanee of Ledge and Garden at her home in Rhode Island. We were joined there and on the tour by Idaho's Dirt Diva, Mary Ann Newcomer of Gardens of the Wild Wild West. I had high expectations of English gardens and they only exceeded those expectations a million times over! Pictures eventually ... I'm still going through them and sighing in rapturous remembrance. 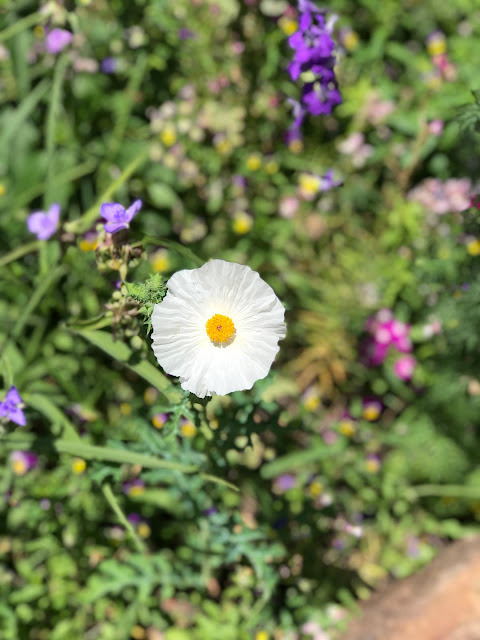 When I made it home, I was too overcome by exhaustion to do much more than pull a few weeds and yank some of the manky plants that were violating my amenities. Then came one of those torrential summer rainstorms and it blew in something that sent my sensitive sinuses into overdrive. From there it was only a short trip to bronchitis and bronchial asthma, which turned into mild pneumonia. The severe coughing caused some vitreous detachment in my right eye, resulting in flashes and floaters that still continue. The floaters are annoying because I think gnats or mosquitoes have gotten into the house and keep swatting at them, only . The optometrist specifically told me no gardening: bending over from the waist is forbidden since it could cause more tears and possibly even a detached retina. While I certainly don't want that to happen, I will admit to occasional forays out to water when I kneeled to pull a weed. That's about as close as I've ever gotten to following doctor's orders. Add to that a seriously wonky MacBook Air. I finally admitted that solving its problems were beyond me and took myself to SimplyMac, an Apple authorized Mac store in my area. I left the store without the Air but with a shiny new MacBook Pro. The Air is now working again, thanks to the store technicians. However, they still have to determine whether several thousand missing pictures are still there or gone forever. I'll visit with them about that tomorrow. Back to gardening ... I just realized I left out Ironweed (Vernonia something), water purslane and Polygonum Pink Buttons. And if you're wondering why the toad lilies are blooming now, so am I. The blooms are sparse and only on the plants in one area are blooming. So it goes on my corner of Katy. There's always something unexpected happening! 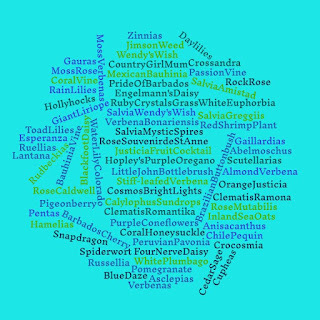 How fun, a word cloud! I can visualize those flowers and since we have had a little heat wave here in RI, I don't blame you one bit for sitting inside in A/C which I DO NOT HAVE! (except a little unit in the bedroom) Cotswolds! They were divine as was the company. Let's do it again! You have had quite the summer so far...good and bad! Hope the heat takes pity on you soon. That's quite a cloud of blooms! Thanks for sharing it, and that was a creative way to stay inside where it is cool. Wow, you've had quite the summer! I can't imagine how hard it is to go out to the garden and not bend at the waist. I love your creative way to beat the heat. I spent the entire weekend of the Fling coughing from a cold, so I understand how you felt. No pneumonia on my part, though, but I'm still coughing somewhat and using my asthma inhaler religiously. Take care of your eyesight. Glad you enjoyed looking at English gardens. I guess by default my garden is very English. Bad luck about your illness. Having a cold when it is very hot cannot be great. Hope you get better soon. A tour of the Cotswolds sounds divine! Glad you were able to enjoy your trip and other garden visits before you became ill. Hope you feel better soon and stay in that A/C! Wow! That's quite a list of plants blooming in July and I can understand your reluctance to go out there to photograph them. Clever idea. Looking forward to seeing photos of your English garden tour.